Why Events instead of webinars or other online marketing tools? In a recent study Bizzabo did, they found that “The average Chief Marketing Officer allocates 24% of their total annual budget to live events in order to connect with customers, educate attendees and generate new leads. Companies like Apple, Microsoft, GE, HubSpot, Salesforce, L’Oreal, Google, Ford and Wells Fargo all understand the value of live events and have committed themselves to marketing strategies that place face-to-face interaction front and center” (https://blog.bizzabo.com/event-marketing-2018-benchmarks-and-trends). There have been so many studies that have found that in-person classes, workshops, seminars, conferences etc. have allowed businesses to generate leads and increase business growth in a way that online marketing cannot. I have told the story of how I used in-person workshops and events to save my business time and time again going from $0 in my bank account to 3k in 2 Days. Why do in-person events work? Because people crave in-person interaction and you will always be more compelling in-person verses online. DOWNLOAD THIS FREE EVENT MARKETING FUNNEL GUIDE! So how do you use events to see amazing growth in your business? By being strategic and planning your event with purpose. If you plan an event just to say you have done an event rather than having a solid goal for your event, your event will probably function and be well attended but will the audience be the right audience primed to purchase your product or service? I learnt about the concept of funnels a while ago and applied it to the event planning and marketing process. If you want your event to work for your business you have to be strategic with who you invite to come and what you do to attract them. Because otherwise you can have an amazing event in terms of content, but the people aren’t interested in working with you further and if they are they don’t qualify to become a client (the don’t check all of the boxes. Remember just because they want to pay you it doesn’t make them a good candidate you should be disqualifying those who won’t be a good fit for your business. More on this later). For now, let’s talk about how to use events as a business growth tool by getting the right people there. Let’s break this down even further! · This is about 3-10 installments of content via video, audio or blog format and is created with the intent of educating and enlightening your audience. It lets them know that you understand them, and their pain point. It highlights their pain point and why they are currently dealing with the problems they are facing (that you can solve). · This should be epic in nature. This simply means that you need to make sure that you wow them. Give them good information that helps them to solve a problem. · Make sure that this content can be linked back to your solution in some way. Be strategic about this. I did an entire blog post breaking this down even further with a worksheet. Check it out here. · At the end of your content, you want to invite a selected portion of your audience to receive a free gift or an opt in or content upgrade. · This content upgrade not only solves a problem and elevate pain but gives you some insight on who win your audience is really in need of a solution. 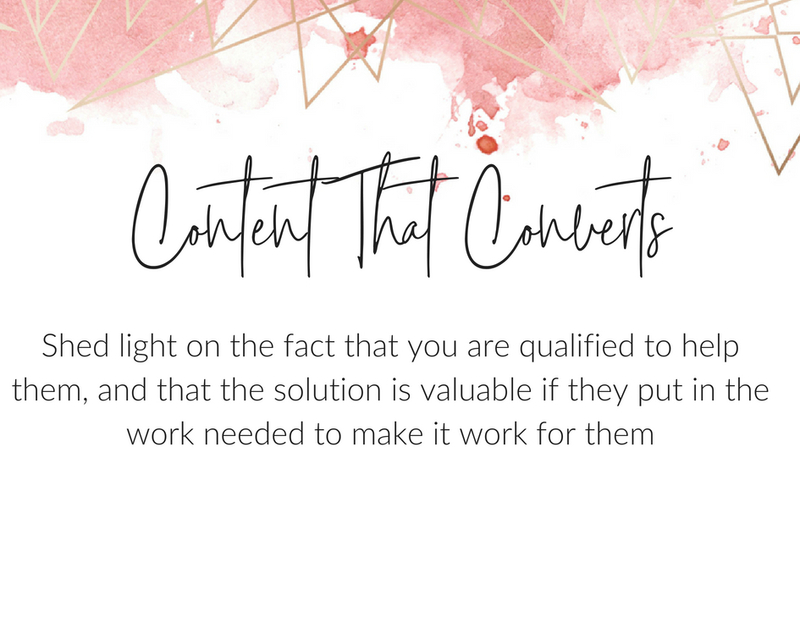 Here is the thing, it is very possible to create a content upgrade that attracts the wrong people, so make sure you are super strategic with what kind of content upgrade you are putting out there. · Your content upgrade should be super appealing only to the people who are ready to take action now towards getting their problem solved, not people who may get their problem solved eventually. · There are many forms of content upgrades however my favorite ones are Checklists and Worksheets. · Your Opt-in offer should come along with an invitation to a free in person or online class specifically for those ready to do what it takes to improve their situation. This is known as a tripwire and this further helps you to qualify your audience. · Take this time to show your audience how you are qualified to help them solve their problem. · The goal of this event and the content you will share at this free event is to share value and show them the work that is involved in solving their problem so that they can make the decision on if they want to solve it on their own or get help in solving it and the value in having someone help them vs. doing it alone. · Then you can share how you can help them to solve their problem and extend an invitation using sales strategies such as urgency (get your seat we only have 6 slots) or scarcity (get your seat while supplies last) etc. · The last kind of content in this category is your email funnel. Many events stop at the event and call it a day, but I highly recommend having a series of emails set up to capture even more sales of those who probably wanted to purchase but needed more time to get the funds or needed to leave early etc. https://blog.bizzabo.com/event-marketing-statistics I highly recommend checking out their articles and statistics and I will link my favorite ones at the end of this article.